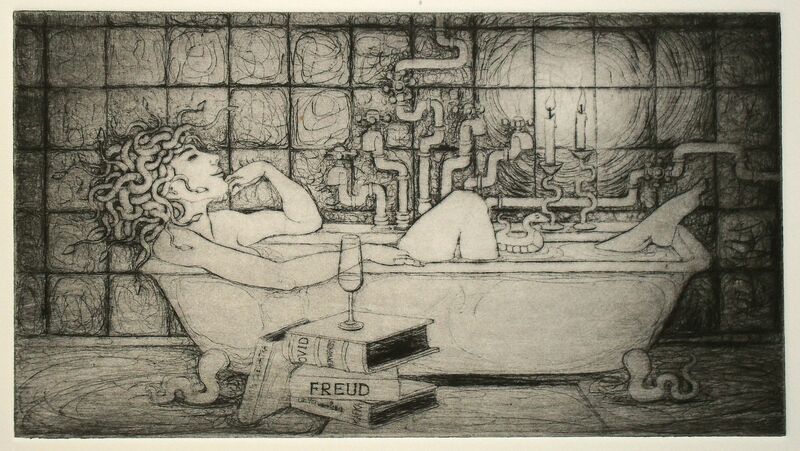 I have printed the ‘Medusa in the Bath’ picture – the February image for my calendar for next year – and I am feeling quite pleased with myself! 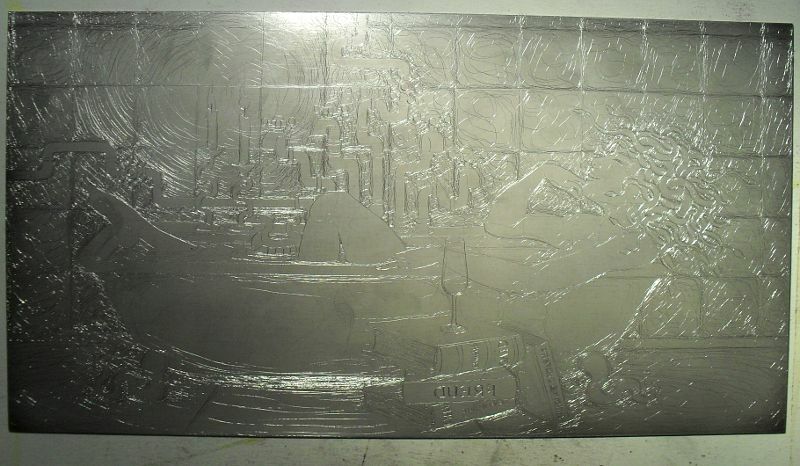 I do enjoy Aluminium etching, but I have to admit it can sometimes be a bit of a crude technique for making a picture. 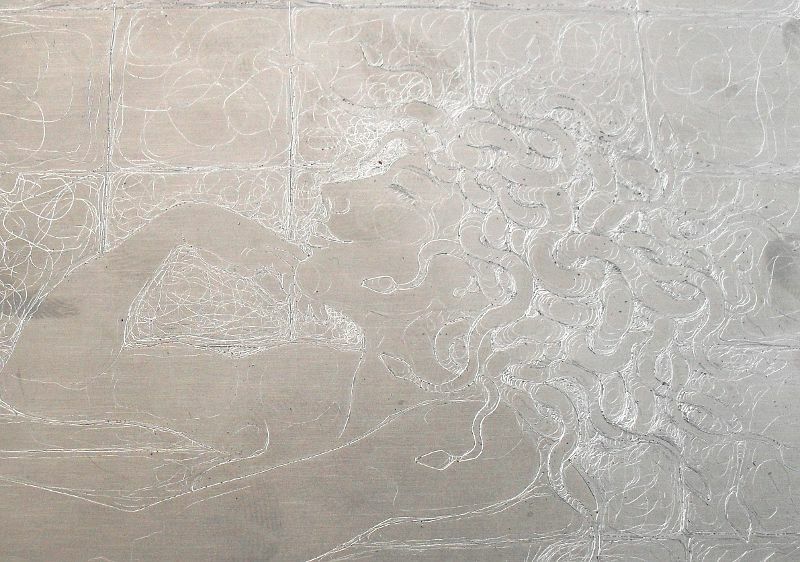 I recall a little bit of copper etching I did, um, something more than 25 years ago now :-o, and I recall being able to get very fine detailed lines. 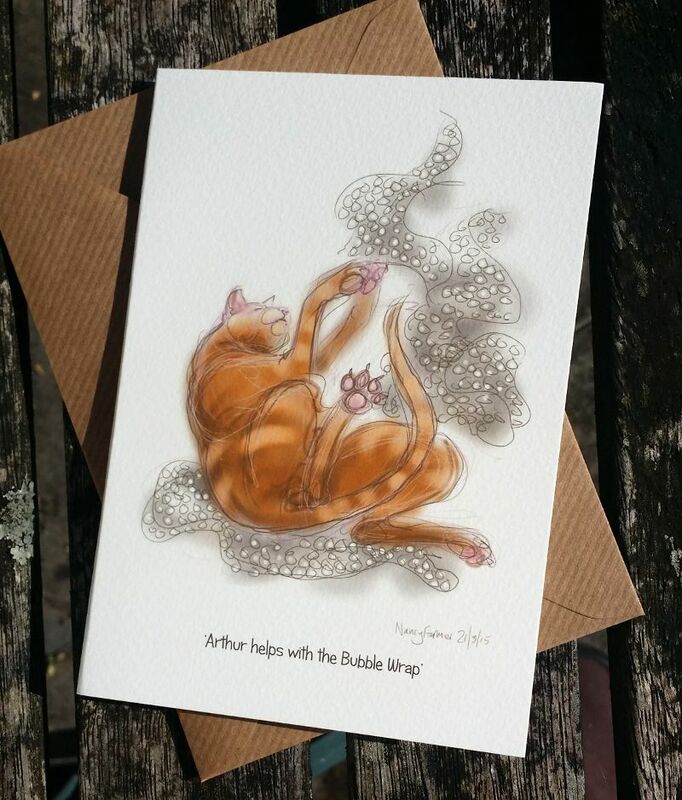 This doesn’t seem to be so much the case with aluminium etching – maybe it is to do with the speed that the etching solution eats into the metal, and the larger grain of the metal. 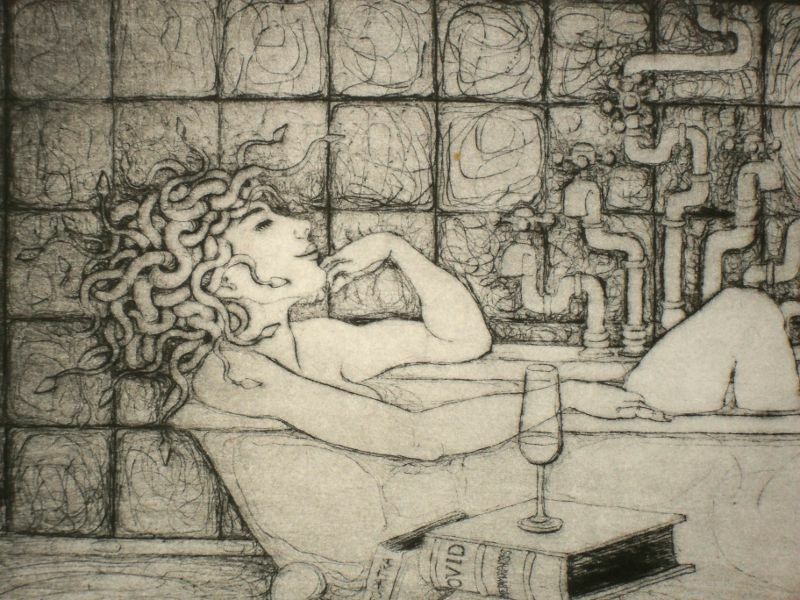 So, I have shied away from including a lot of detail in my etchings, and the drawing of Medusa in the Bath did have quite a lot going on… from the twisty taps, to the appropriate reading matter, to the little snake-shaped rubber duck… a shame to simplify it. 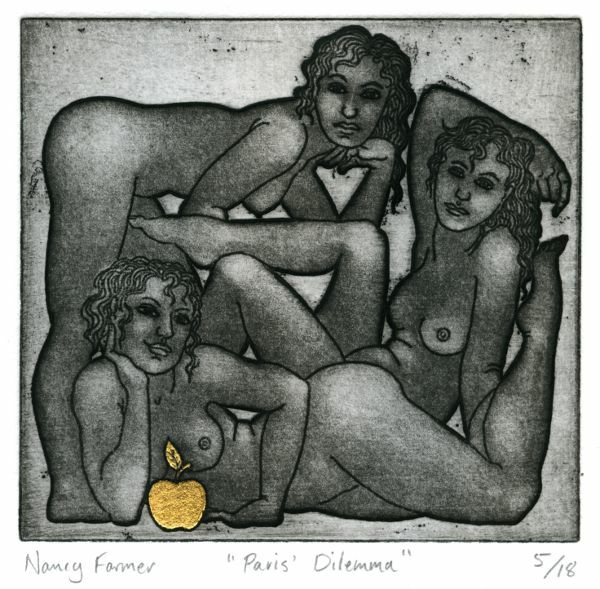 So I took the plunge and did the entire thing in drypoint – a technique I used a little in a couple of recent posts. The disadvantage, as I have said before, is that the plate does not last for very long, but, much to my surprise, I got 10 good prints from it with only a little sign of losing the image, maybe I could even have printed more. If anyone is interested to know what I am using to draw / scratch with, I am not using a traditional drypoint needle, but some leftovers of my jewellery days – some tiny tools that I have always called burrs, though they are also known as fraziers. The smallest ones of these work very well: http://www.hswalsh.com/Fraizer-.aspx?i=TF0809&c=1193 You need a handle to put these in, and you have to remember not to press too hard or the head can snap right off, but they are quite cheap to buy a dozen of, and you can re-sharpen the point, if you break just the very tip of it. This is not the use for which they are intended, but they work a treat, and also for drawing through a resist prior to etching. I am now wondering if my pointy tools would work on steel, which should last longer, though frankly I am probably happy with 10 prints. Of course the the other reason I am feeling pleased with myself is that that brings the total of pictures up to 11… only one more to go!